Arsenal manager Arsene Wenger has claimed that Per Mertesacker is not to blame for the late equaliser conceded against Liverpool and that his defenders’ lack of communication is what caused problems, reports the London Evening Standard. The Gunners conceded a late equaliser against the Merseyside club on Sunday that leaves them four points off the top four going in to the festive period. 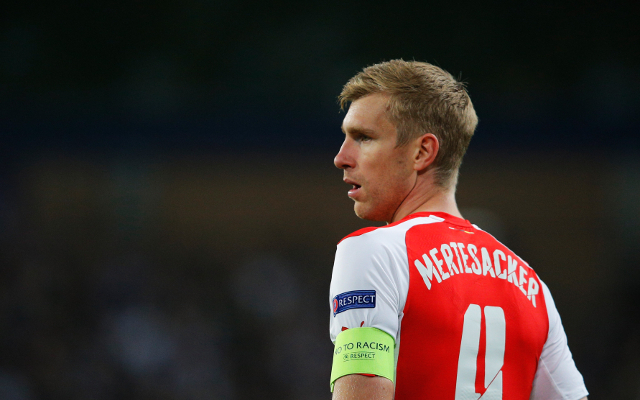 Jamie Carragher and various other pundits have come out to criticise Mertesacker’s performance in the 2-2 draw. However, Wenger does not believes that the 2014 World Cup winner should be blamed for the draw. The Frenchman believes that the whole defence should take responsibility for their lack of communication. “I don’t want to go into any individual assessment,” the 65-year-old told reporters. The North London club next play against QPR at the Emirates Stadium on Boxing day. They will be hoping for a win to get their season back on track after an inconsistent first few months of the campaign.